The reserves were beaten at home 1-0 by Wrexham tonight in a Pontins Holiday League match in front of a crowd of 109. There was an appearance by new signing Alex Meechan but trialist Senegalese defender Alcaly Camara was sent-off. The only goal of the match came on the hour through Andy Fleming. Chester have completed the signing of former Forest Green Rovers winger Alex Meechan on loan until the end of the season. Meechan left the Gloucestershire side last week to return nearer to his Liverpool home. Meechan has previously played for Swindon Town, Bristol City, Yeovil Town, Dagenham & Redbridge, Leigh RMI and Halifax Town. Also signing in at Deva Stadium for an undisclosed fee is 33-year-old Peterborough United forward Simon Yeo. Yeo began his career at Hyde United before moving for the first of two spells a Lincoln City in July 2002. He went on to make 99+58 appearances scoring 51 goals in the process for the Sincil Bank club. He moved to Peterborough last August and scored twice in 9+7 appearances. The club have also received another five-figure bid from Darlington for Gregg Blundell on the last day of the transfer window. Sad news to report that former Chester manager Derek Mann has died over the weekend at the age of 63. 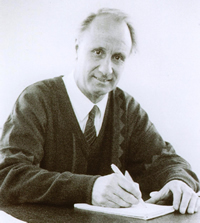 Mann was in charge of first team affairs at Chester City between January-April 1995 initially on a caretaker role before landing the job on a permanent basis. Derek had been working as a sports coach at Telford College of Arts and Technology and was a youth coach at AFC Telford. He was also heavily connected with Wolves where he was kit man and part of the scouting team at Molineux. The home League Two game against Darlington on Good Friday 6 April will now kick-off at 15:00hrs and not 19:45hrs. A run of three home league defeats was brought to an end on Saturday but City could only manager a point against a Mansfield Town side that was reduced to ten men for the majority of the game. Barry Conlon’s red card for violent conduct after just ten minutes should have given City a boost but it was the visitors who held a half-time advantage when Jake Buxton headed home on 32 minutes. City deservedly drew level just after the hour mark with Lee Steele (left), given a starting place following the same of Jon Walters, finished well after being set up by Sean Hessey. Laurence Wilson was carried off after 37 minutes with what looked like an ankle ligament injury that may sideline him for a couple of weeks. The point lifted City one place to 11th in League Two. The Blues are in action next on Saturday when they visit Lancashire hoping to do the double over Accrington Stanley who, after a bright start to the season, have slipped to 20th just one point above the relegation zone. The youth team drew their Youth Alliance North West Conference derby match at Wrexham this morning 0-0. Tickets for the forthcoming match at Wrexham will be on sale at the following times. Tickets will remain on sale until the 16th February or until the allocation is exhausted. Season Ticket Holders and TRUEBLUE card holders should produce their Season Ticket or TRUEBLUE card when they make their purchase. Tickets are also available to purchase online however these orders will not be processed until Wednesday 31st January in order to give priority to Season Ticket and TRUEBLUE card holders on Tuesday. You can place your order online here. There will be a small handling charge applicable to online sales and please note that online sales will stop at 3pm on Wednesday 14th February to allow time for delivery. For all ticket sales whether online or in person, a limit of two tickets per person will apply. Good luck to striker Jonathan Walters who has moved to Championship side Ipswich Town for a fee that could end up in the region of £250,000, plus a sell-on clause. The deal will keep him at Ipswich until 2010. Walters, who moved to City on a free transfer from Wrexham in the summer, obviously impressed the Suffolk club during the two recent FA Cup matches between the sides (left). The player has agreed personal terms and passed a medical this afternoon. Walters has scored 10 goals in 30+3 appearances this season. Chester have already rejected a £100,000 bid from League One leaders Scunthorpe United for the striker who began his career as a youth player at Blackburn Rovers before moving to Bolton Wanderers in 2001. Three years later he moved to Hull City for £50,000. He also had loan spells at Crewe Alexandra, Barnsley (while at Bolton) and Scunthorpe United (while at Hull City). Chairman Steve Vaughan has since added that the fee received from Ipswich is £100,000 now and further payments (up to a total of around £200,000) are based on both player and club performances. The Blues will be without three key defenders as they prepare to tackle Mansfield Town in a League Two clash at Deva Stadium tomorrow (15:00hrs). David Artell serves a one match ban after picking up his fifth yellow card of the season at Portman Road. Paul Linwood is also sidelined with a one match ban for a similar offence, while Ashley Westwood will be out for sevaral weeks after tearing a hamstring in the recent home defeat by Wycombe Wanderers. City are without a home win since the 4-1 victory over Lincoln City on 9 December six matches ago. The Stags, who lie five places and four points below City, recently appointed ex-Chester favourite Billy ‘Whizz’ Dearden as manager for his second spell in charge of the Nottinghamshire club. His previous three year spell ended in 2002. The two sides are yet to meet this season after the pre-Christmas match at Field Mill was postponed due to a frozen pitch. Mansfield will be without midfielder Giles Coke, who has had a knee operation and will be out for a month. 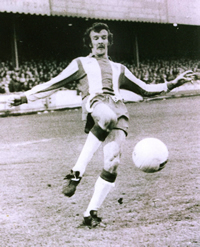 Billy Dearden had two spells as a player for Chester. In 1968 he signed from Crewe Alexandra before moving to Sheffield United two years later. He returned from the Bramhall Lane club in 1975 (pic Left) and remained at Chester until 1977. During those spells he scored 29 goals in 120+1 appearances. Chester are currently giving trials to the Rhyl’s 25-year-old Liverpool-born striker Lee Hunt. The youth team have an away match in the Youth Alliance North West Conference at rivals Wrexham tomorrow morning. The club have been fined £1,000 by the Football Association and warned as to their future conduct after admitting a charge of failing to ensure its players conducted themselves in an orderly fashion during the away match at Barnet on 28 October 2006. City have also been charged with a similar offence in the home game against Milton Keynes Dons on 30 December. The club have today admitted that charge also and have requested a personal hearing. Added to these two charges is the one of: Two breaches of FA Rule E 20(a) - (1) In or around the 58th minute, failing to ensure that their players conducted themselves in an orderly fashion and refraining from provocative behaviour (2) After the final whistle, failing to ensure that their players and/or officials and/or employees conducted themselves in an orderly fashion and refrained from threatening and/or provocative behaviour. This charge refers to the away match st Shrewsbury Town on 25 November 2006. City also requested a personal hearing on this. At the same game club chairman Steve Vaughan was charged with violent conduct. Vaughan denied the charge and has requested a personal hearing. The match will now take place at Sport City Manchester on Monday 30 April, kick-off at 14:00hrs. The Blues fought out a goalless stalemate at the Memorial Stadium on Saturday but the hard-earned point was enough to lift them two places to 12th in League Two. The Memorial Stadium pitch was only passed fit at 13:45 with the heavy muddy surface sanded in many areas following a rugby match played the night before. That combined with a difficult swirling wind meant this was never going to be a spectacle. Both sides struggled to adapt to the conditions and it would be fare to say Rovers bossed the first-half and Chester the second. The Blues had goalkeeper Jon Danby to thank for two fine saves, in the first half from Lewis Haldane clawing the ball away that was heading for the top corner, and in the dying minutes of the second half from point blank range he saved from Craig Hinton. In between Gregg Blundell and Jon Walters both spurned great chances to score for City. City look to put the midweek FA Cup disappointment behind them when they return to League Two action at Bristol Rovers tomorrow. The Pirates currently occupy the last play-off spot and are just three points above the Blues, they are in-form and have won four and drawn two of their last six matches. City have won their last three away league matches at Peterborough United, Notts County and Grimsby Town and will be keen to add a fourth. 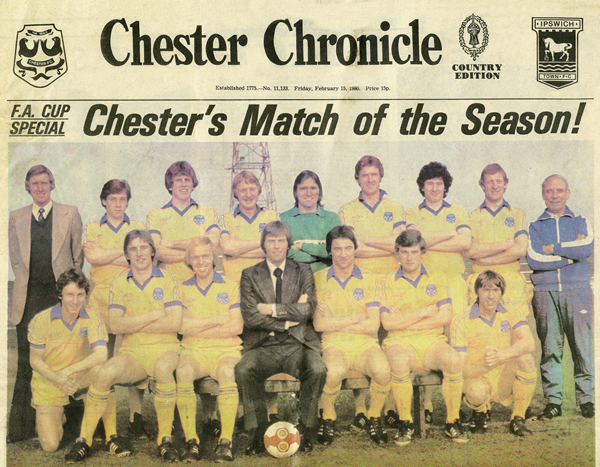 Rovers are a bit of a bogey side for Chester who have never beaten them in the West Country whether at Eastville, Twerton Park or the Memorial Ground since their first clash in 1981/82 ended in a 2-2 draw after Chester had held a two goal lead. Defender Ashley Westwood misses the game tomorrow with a hamstring injury and it remains to be seen whether Sean Hessey or Paul Linwood step in replace him alongside Dave Artell. Good luck to midfielder Stephen Vaughan has joined League Two side Boston United on a permanent deal until the end of the season after being recalled for his loan spell at Rochdale. He made no appearances for the Spotland club. Vaughan, son of chairman Steve Vaughan joined City back in the summer of 2004 after being released by Liverpool. He was appointed club captain at the start of the season and in total made 52+22 league and cup appearances for Chester. A goal six minutes from time was all that seperated Chester from their Championship opponents Ipswich Town at Portman Road last night. Matt Richards’ curled shot from five yards outside the edge of the box put to an end a dogged display from City who were backed throughout the 90 minutes by a noisy 500 travelling support, many of whom took advantage of subsidised travel thanks to club sponsor UK Sameday. City got the ball in the net twice on the night, the first occasion referee Friend failed to allow advantage after a foul on Jon Walters, the ball fell to Gregg Blundell who stretched to prod the ball past home ‘keeper Price, only for play to be called back for a City free kick outside the box. On the second occasion after the break Jon Walters was penalsed for a foul on Price. The youth team were knocked out of the FA Youth Cup a the fourth round stage at Bristol City last night. The Blues were reduced to nine men following first half dismissals of James Owen and James Gregory, and were eventually beaten 4-0 to bring to an end their memorable run in front of a crowd of 541 at Ashton Gate. While the first team head for Portman Road tomorrow night, Jim Hackett’s youth team travel to Bristol City for an FA Youth Cup fourth round tie at Ashton Gate (kick-off 19:00hrs). The winners of the tie will face an away trip to either Hull City or Arsenal in the fifth round. Chester suffered their third successive home defeat at the hands of Wycombe Wanderers on Saturday. With two minutes remaining, and neither side having managed a serious effort on goal all day, the game seemed destined for a draw before Jermaine Easter popped up at the far post to easily convert Kevin Betsy’s right wing cross and the points were gone. After the match assistant manager Graham Barrow told Teamtalk: “I’m not wishing to seem too negative, but that game had 0-0 all over it and somehow we’ve lost. It was naivety that cost us. One minute we were pushing for a winner and then they have broken down field and we’ve been caught out at the back. The Blues dropped four places to 14th following this latest reverse and will now turn their attentions to Tuesday night’s FA Cup third round replay at Ipswich Town. One player who must be doubtful for the match though is defender Ashley Westwood who limped off before half-time on Saturday with a hamstring strain. City entertain Wycombe Wanderers tomorrow at Deva Stadium (15:00hrs) looking to replicate their away form of late on home territory. The Blues have won the last three games on their travels to lift them to within two points of a play-off position, but their home league form of late has not come up to standard with heavy defeats by Macclesfield Town and Milton Keynes Dons. The Chairboys have rightly grabbed the headlines in midweek after holding champions Chelsea 1-1 in the first-leg of the Carling Cup semi-final at home. Manager Mark Wright will have defender Phil Bolland available for selection after he served a one match suspension at Grimsby in midweek. Wycombe welcome back Leon Crooks, Anthony McParland and Folawiyo Onibuje who were all cup-tied in midweek. The teams last met in September when a single Kevin Betsy goal separated the teams at Adams Park. Despite not yet making a first team appearance through hinjury, the club have offered Glenn Cronin an extension to his contract until the end of next season. The midfielder signed from Exeter City last summer suffered a broken metatarsal in pre-season training and expected to start his comeback with the reserves shortly. The reserves recorded only their second Pontins Holiday League win of the season tonight when they beat Accrington Stanley 2-1 at Deva Stadium. Chris Holroyd scored a brace for City. Chester’s first win at Blundell Park since 1979 last night lifted the Blues five places and within two points of the play-off places. City looked comfortable through most of the game and but for a great display in the home goal by Phil Barnes, who made several outstanding saves, would have come away winning by a larger margin that 2-0. The Blues took the lead though Dave Artell eight minutes after the break as the defender bravely headed in from close range after Ashley Westwood’s header from a Roberto Martinez corner had struck the crossbar. The points were wrapped up 12 minutes from time as Gregg Blundell headed home Simon Marples’ pin-point back post cross to end the best move of the game. A delighted City manager Mark Wright said after the win: “I thought our boys deserved to beat Grimsby and, considering we were playing with two or three injuries and two or three boys were sick in the dressing room before the game with some sort of a bug. Jon Walters and Laurence Wilson were both struggling, so for them to go out and do what they did was fantastic. Ashley Westwood has played the last three or four games with a sore back and hamstring spasm and he has been limited. Everybody could see he wasn’t running properly against Grimsby, so we’ll have to take a look at him. Defender Phil Bolland sits out tonight’s League Two clash at Grimsby Town with a one match suspension after picking up his fifth yellow card of the season at Notts County. The Mariners have today signed Carlisle United central defender Simon Grand on an emergency loan and he’s expected to play tonight as is striker Gary Jones who has just completed a four match ban. Grimsby have lost four of their last five matches and currently lie 18th in the division, four points behind the Blues who also have a game in hand. Tonight’s game is the only one to be played in League Two and a victory for the Blues could see them leap five places. Should City overcome Ipswich Town in their third round replay they will have a home fourth round tie against Swansea City on the weekend of 27/28 January. After a battling cup performance Chester City will count themselves unfortunate that they didn’t dispose of Ipswich Town at the first time of asking on Saturday. The Blues enjoyed the majority of the possession, especially in the first period, and had a Gregg Blundell goal ruled out through a marginal offside decision. The pulsating third round cup-tie ended goalless and the two sides must now replay at Portman Road on Tuesday 16 January (19:45hrs). Meanwhile City will have an eye out on tomorrow’s fourth round draw that’s due to take place at 13:30hrs. The replay at Ipswich is all-ticket for Chester fans. Tickets will go on sale to Season Ticket and True Blue card holders only on Monday 8th January between 10.00 and 16.00. Season Ticket holders should present Voucher H from their season ticket book to make their purchase. Tickets will go on general sale on Tuesday 9 January however the ticket office will only be open between 10.00 and 14.00. Tickets will continue on general sale from Wednesday onwards between 10.00 and 16.00 and also after the Wycombe Wanderers home fixture next Saturday. Tickets are also available online from the official club website. These will not be processed however until Tuesday. Tickets are also available for disabled supporters, priced at £10.00 which includes entry for a carer. Arrangements should be made direct with Ipswich Town football club by contacting Aaron Claxton on 01473 400517 or Warner Duff on 01473 400556. The club’s official sponsor UK Sameday are subsidising coach travel to Portman Road to the tune of 50%. This means fans can now enjoy travel to the third round replay against Ipswich Town for just £10.00. Supporters intending to take advantage of this offer MUST reserve a seat prior to travel. This should be done by telephoning Barrie Hipkiss on 01244 379011 before 20:00hrs. Bookings must be made by Friday 12 January. Goals from James Gregory, Lloyd Ellams, Paul McManus and Neil Carroll gave the youth team a resounding 4-0 home league victory over Stockport County on Saturday morning. Chester City welcome Championship side Ipswich Town to Deva Stadium tomorrow in the third round of the FA Cup. It’s been well documented that City arrive at this stage having been reinstated into the competition after second round opponents Bury were expelled following their 3-1 replay win at Chester for fielding an ineligible player. Non the less, City will be looking to take full advantage of this as they contest the £40,000 prize money at stake and a place in the fourth round. City have injury doubts over defender Ashley Westwood who tweaked a hamstring in the home defeat by Milton Keynes Dons and aggravated it after scoring the winner at Notts County on Monda, and fellow defender Paul Linwood who also has a hamstring strain. 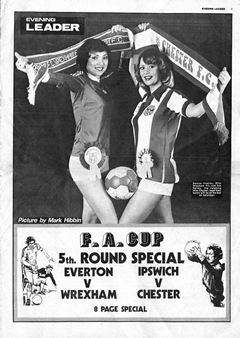 The teams have met on only one previous occasion at the fifth round stage back in February 1980. 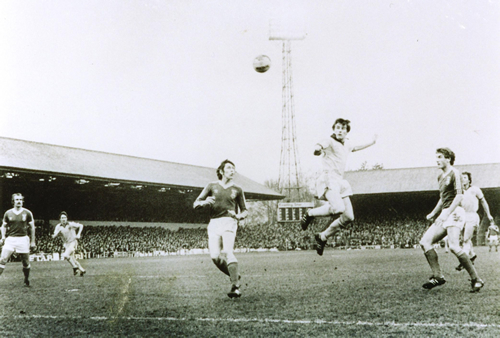 On that occasion Alan Oakes’ side narrowly lost 2-1 at Portman Road to a side full of household names that included: George Burley, Mick Mills, Frans Thijssen, Russell Osman, Terry Butcher, Trevor Wark, Arnold Muhren, Eric Gates and Alan Brazil amongst others. They were managed by Bobby Robson who was presented prior to the match with his Bells manager of the month award. Thousands of Chester fans made their way to Suffolk on that occasion from all parts of the country, two chartered trains were also run direct from Chester station. Despite taking an early lead through Brynley Jones two goals before the break from Burley and Walk were enough to see off the brave fight from the Seals. The two sides almost met in the competition in 1948 at the third round stage. Ipswich were leading Aldershot with 27 minutes remaining before their second round tie was abandoned due to fog. When the game was replayed a week later Aldershot won 3-0 and The Shots went on to beat Chester 1-0 in the third round. The Blues are in the third round for the third successive year having lost to Cheltenham last season in a replay, and Bournemouth the year before. You have to go back 20 years though for the last time City proressed beyond this stage when on a snow covered Racecourse Ground rival Wrexham were beaten 2-1 to set up a home tie with Sheffield wednesday. Tomorrow’s match is NOT all-ticket and supporters should pay on the gate as normal. Needless to say, with a bigger than average crowd expected, you should get to the ground early to avoid congestion at the turnstiles which will open at 13:30hrs. The draw for the fourth round will take place at 13:30hrs on Monday by England Women’s Coach Hope Powell and captain Faye White, the Chester/Ipswich ball is number 11. Brynley Jones opens the scoring for Chester at Portman Road in 1980. Team picture taken for the occasion from the front cover of the Chester Chronicle special supplement. Chester have signed striker Lee Steele on a permanent basis following his loan spell from Leyton Orient. He is contracted until the end of next season. A day after returning to Chester from a loan spell at Boston United striker Drewe Broughton has rejoined the York Street club on loan until the end of the season. Ryan Semple (left) has returned to Lincoln City after failing to gain a regular place in the side during his loan period. Manager Mark Wright had pursued the midfielder on a couple of occasions but he made only 2+4 appearances in a City shirt since signing at the end of November. Striker Drewe Broughton has returned to Deva Stadium from his loan spell at Boston United, The Pilgrims’ current financial plight means they are unable to keep him. Broughton made 8+0 appearances for the York Street club, scoring 3 goals but being sent-off twice. Meanwhile captain Stephen Vaughan has joined League Two side Rochdale on a one month loan. Wright’s shopping list in January includes a midfielder, centre-back and a goalkeeper. City now have dates for their two outstanding League Two fixtures. They will travel to Grimsby Town next Tuesday 9 January (19:45hrs) and to Mansfield Town on Tuesday 6 March (19:45hrs). City got back to winning ways with a 2-1 victory over Notts County at Meadow Lane this afternoon. The Blues took the lead on 34 minutes following a great strike by Jon Walters but were pegged back on the stroke of half-time by Jason Lee. The second and decisive goal came twelve minutes from time with Ashley Westwood (left) heading home following a Roberto Martinez corner before having to be substituted with a hamstring injury. City remain in 15th place and now look forward to a third round FA Cup tie with Ipswich Town at Deva Stadium on Saturday.